Quintessentially British design and exquisite craftsmanship combine with the vintage-inspired Emmy London collection. 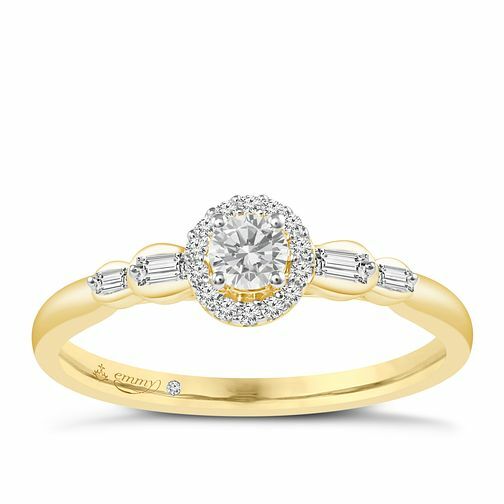 This sparkling 1/4ct diamond ring features a round brilliant cut diamond encircled with smaller diamonds creating a halo, elegantly crafted in 18ct yellow gold and finished with a secret diamond inside the band. The prominent centre is framed by beautiful baguette cut diamonds on the shoulders. This ring is gorgeously elegant and unique, and features I1 certified diamonds and an independent IGI certificate.